Pet owners must be very aware of the serious deficiencies and risks associated with any dental service performed without anesthesia. AAHA’s 2013 Dental Care Guidelines for Dogs and Cats states that "cleaning a companion animal’s teeth without general anesthesia is considered unacceptable, and below the standard of care." Anesthesia free pet dental services results in inadequate care. Dental scaling without anesthesia will not allow sufficient access of the dental (teeth) surfaces for complete cleaning or evaluation. The American Veterinary Dental College has drafted a specific statement to discourage anesthesia free pet dental scaling. Watch the following video for more information about the risks of anesthesia free pet dental cleanings to your pet. 1. Patient motion prevents adequate view of all of the teeth. 2. Teeth or dental surfaces you can't see, won't be cleaned adequately. 3. Inadequate cleaning will allow plaque bacteria to cause periodontal disease. 1. Patient motion can cause oral injury during teeth scaling procedures. 2. Patient motion will not allow for dental radiographs to be taken adequately. 3. Patient motion may cause pet pain if periodontal probing is performed. 4. Inability to see may cause misdiagnosis, or failure to diagnose any problems. 5. Dental calculus (tartar) may fall into the pet's respiratory tract, and cause severe disease or even death. 6. Owners may be led to believe their pet is healthy, while severe disease may be present. The California model of non-anesthesia has resulted in complaints by the public! The California Veterinary Medical Board has taken action. 1. A consumer complained that their pet was taken for non-anesthesia dental services for five consecutive years, and the owner felt misled that the services were equivalent to those of a full service veterinary dental provider. Severe periodontal disease developed and progressed, and was never diagnosed. Failure to diagnose periodontal disease resulted in the loss of many teeth. 2. One complaint filed reported death of their pet during non-anesthesia dental services. The owner believed that anesthesia was of high risk and that anesthesia free dental services were risk free. Unfortunately, anesthesia free dental services can be very frightening and stressful for pets, and even result in injury or death. 3. One complaint reported that their pet suffered a broken jaw during anesthesia free dental services. Veterinary dental services are professional services that allow for patient assessment, diagnosis and treatment. Sedation or NAD, will not allow for professional dental services of significant value to be provided to pets. If you want to have dental services performed, they should be properly performed with anesthesia to allow for accurate diagnosis and appropriate treatment. Please read these links to address some of your concerns about dental services. Anesthesia concerns are valid; however anesthesia is of high value. 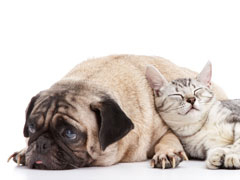 Teeth cleaning is not enough for your pet's health care. Dental radiology allows for diagnosis and treatment of important dental health problems. What is the cost for dental services with anesthesia? What can you do to reduce the cost and to avoid frequent anesthesia associated with professional dental services? What products are proven to be effective to help reduce the need for anesthesia and professional dental services? AAHA Position= American Animal Hospital Association with a formal position on the standard of veterinary dental care.